NWG is off to the Oval (again) today. She feels that perhaps that because she's been so often that she should get 20% off all food and drink and a decent seat. And she has thought long and hard and has made the important decision to support the West Indies. 1. Because NWG has seen them more than any other team and save for the South Africa game, they have won every time. Clearly she is a good luck charm. 2. Her friend is West Indian, well technically she's French, ok, so it's complicated, and she will be at the cricket with them. It would seem rather churlish to support Sri Lanka to simply even out the numbers. 3. Because West Indies beat England it seems natural to want them to win the tournament and thereby making England's exit slightly more acceptable. 4. Because she wants to. 5. Because she wants to see another Chris Gayle- Australia performance. That is twenty20 batting at its best. 6. Because she's really tired and can't make any solid, educational reasons to support Sri Lanka right now; West Indies seems like the easier option. Some say that England's exit from the Twenty20 gives them more time to concentrate on some piddly little tests coming up. Some say that this will give England time to get their plans into action. Some say it's a blessing in disguise. 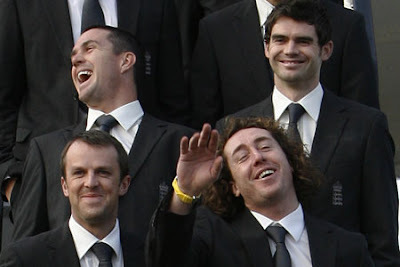 Some say England were never going to do that well anyway. Well. NWG is feeling very pessimistic today. England needed to do better. England require momentum. NWG feels that England are in some kind of traffic jam at the moment. NWG needs a lie down because she's got to do it all again tomorrow at the Oval.